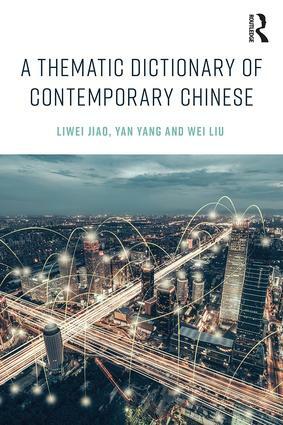 A Thematic Dictionary of Contemporary Chinese is a unique resource for intermediate to advanced students of Chinese. The dictionary presents 9,000 words organized thematically in approximately 300 different subject areas. These themes cover the vocabulary necessary for daily use and for conducting meaningful conversations with native Chinese speakers on a variety of topics, from politics to business, and from hobbies to education. Each vocabulary item is annotated with the most frequent collocations, allowing learners to improve their fluency by storing new vocabulary in larger linguistic units. Cultural and linguistic tips enable learners to grasp the vocabulary more effectively and increase their awareness of Chinese culture embedded in the language. Review exercises are provided throughout to ensure learners have ample opportunity to practice the new material. This is a great resource for both independent study and classroom use and will be of interest to students and teachers of Chinese alike. For further understanding of Chinese expressions, students are encouraged to read 500 Common Chinese Proverbs and Colloquial Expressions and 500 Common Chinese Idioms. Joël Bellassen, Président de l'Association Française des Professeurs de Chinois. Liwei Jiao is Lecturer of Chinese at Brown University, USA. Besides his rich experience of teaching Chinese at various levels at Renmin University of China, Durham University and University of Pennsylvania for 20 years, he publishes extensively in Chinese phraseology, language and culture, and Chinese phonetics. Among his many publications are 500 Common Chinese Idioms (co-authored, 2010), 500 Common Chinese Proverbs and Colloquial Expressions (co-authored, 2013), Crossing Cultural Boundaries (co-authored, 2009, 2015) and A Cultural Dictionary of the Chinese Language (forthcoming). He is a contributor to The Routledge Encyclopedia of the Chinese Language (edited by Sin-Wai Chan, 2016) and Encyclopedia of China (3rd edition, forthcoming). Yan Yang is Associate Professor of Chinese in the College of International Students of Southeast University, China. She was a visiting scholar at Emory University, USA, from 2015 to 2017. Her publications include Pragmatic Quantitative Research on Shi Structure of Modern Chinese (2014). Wei Liu is an Instructor in Chinese at the Hotchkiss School, USA. Prior to going to Hotchkiss, she spent seven years teaching Chinese at Harvard University, Brown University, and Wesleyan University. Wei Liu is also an AP Chinese Reader for the Educational Testing Service and a Chinese Rater for The Praxis Series assessments.